Trade Organization | California Attractions & Parks, Inc.
CAPA represents California Amusement Parks and Attractions large and small, from family-owned local parks to world-renowned destination resorts. Our members directly employ more than 135,000 workers and produce more than $14 billion in annual state commerce. We are the economic foundation of many communities throughout the State. Our industry creates dreams, happiness, and memories never forgotten. Our parks are part of the history of California and have helped form our culture. The creative genius that created these parks, icons, and stories continues to flourish, bringing people together worldwide. CAPA is based in Sacramento. In addition to parks, CAPA represents all aspects of the amusement and theme park industry, including ride manufacturers, food concessionaires and hotels. 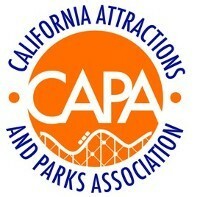 The California Attractions and Parks Association (CAPA) celebrates its 15th Anniversary in 2019. CAPA thanks the legislature for recognizing this milestone. Click here to read Assembly Concurrent Resolution 25 marking March 14th as California Attractions and Parks Association and highlighting the many contributions made by CAPA Members.